“He Named Me Malala” (2015). Cast: Malala Yousefzai, Ziauddin Yousefzai, Toor Pekai Yousefzai, Khushal Khan Yousefzai, Atal Khan Yousefzai, Shazia Ramzan, Kainat Riaz. Director: Davis Guggenheim. Book: Malala Yousefzai and Christina Lamb, I Am Malala. Web site. Trailer. In October 2012, 15-year-old Pakistani schoolgirl Malala Yousefzai was unexpectedly – and tragically – thrust onto the world stage. While traveling home from school, Malala and two of her friends, Shazia Ramzan and Kainat Riaz, were shot by an armed brigade of the Taliban, the militant fundamentalist group that took control of Pakistan’s Swat Valley, where Malala and her friends were born and raised. Malala was targeted for assassination because of her outspoken advocacy of girls’ education, a right that was being systematically eliminated by the Taliban in its implementation of strict Sharia law. Outrage at the incident reverberated around the world. With a bullet lodged in her head, Malala survived the shooting but was gravely injured. It was unclear whether she would recover and, if so, what quality of life she would have. She and her family (father Ziauddin, mother Toor, and brothers Khushal and Atal) were hastily airlifted to England, where Malala underwent intensive medical care. Remarkably, Malala made a miraculous recovery. She still bears the scars of her injuries, including some permanent facial nerve and hearing damage, but her will was left intact. In fact, some would say she grew even stronger as a result of this incident. After surviving a Taliban-sanctioned assassination attempt, girls’ education advocate Malala Yousefzai made a remarkable recovery to continue her work and inspire countless others worldwide, as depicted in the uplifting new documentary, “He Named Me Malala.” Photo courtesy of Fox Searchlight Pictures. So why was Malala targeted for assassination? In 1992, five years before Malala was born, the Taliban-linked organization known as TNSM (Tehreek-e-Nafaz-e-Shariat-e-Mohammadi) infiltrated the Swat Valley under the leadership of Sufi Muhammad. A decade later, Muhammad’s son-in-law, Maulana Fazlullah, took over leadership of the TNSM, promoting a hardline fundamentalist agenda. Dubbed “the Radio Mullah” for his fervent inflammatory broadcasts, Fazlullah and the TNSM effectively took control of the region from the Pakistani government in 2007 after a series of deadly military skirmishes. The rights of women were systematically eliminated, culminating in a complete ban on female education in 2009, cutting off 40,000 girls from being able to attend school. And, to enforce the ban, an ongoing campaign of destruction began, resulting in the bombing, torching and dismantlement of up to 400 schools. 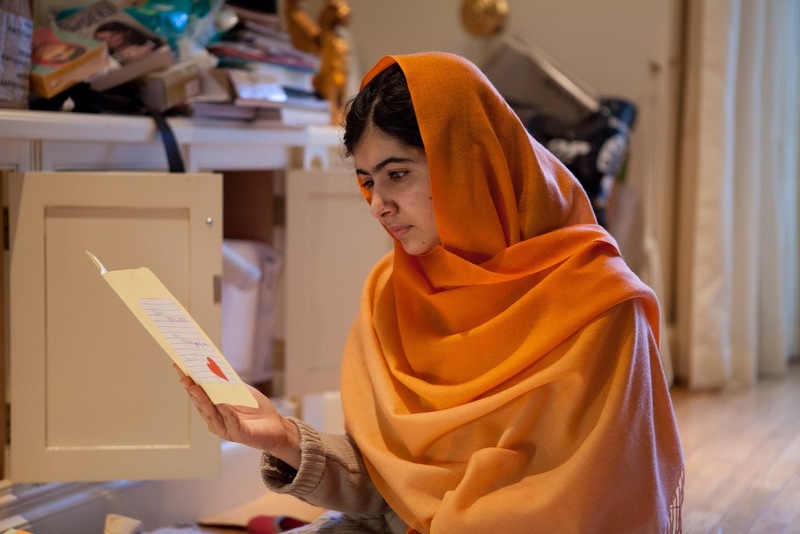 The Taliban’s tactics prompted Malala to take a stand. Beginning at the tender young age of 10, she began campaigning for the rights of girls to receive an education. Having grown up the daughter of a mother who was unable to access quality education and a father who founded a school aimed at training a new generation of women leaders, Malala took the cause seriously. She even wrote a blog for the BBC detailing her life under Taliban rule and her views on promoting education for girls. But, once Malala’s identity became known, she was immediately placed on the Taliban’s hit list. Despite their horrific acts, the assassins failed in their task. Thanks to a long but effective period of treatment, Malala came back more determined than ever. Even though she’s unable to return to her homeland for fear of further reprisals, she is now in the public eye more than ever. As the co-founder of The Malala Fund, a non-profit organization focused on the rights of girls to quality education, she has expanded the scope of her cause beyond her native Pakistan. She now champions education for girls worldwide, visiting such locales as Nigeria, where schoolgirls have been kidnapped by the Islamic extremist group Boko Haram, and Jordan, to which refugees from neighboring Syria have been fleeing to escape the ongoing carnage in their homeland. She has received widespread recognition for her work, including being named the winner of the 2014 Nobel Peace Prize, the youngest-ever recipient of this esteemed honor. 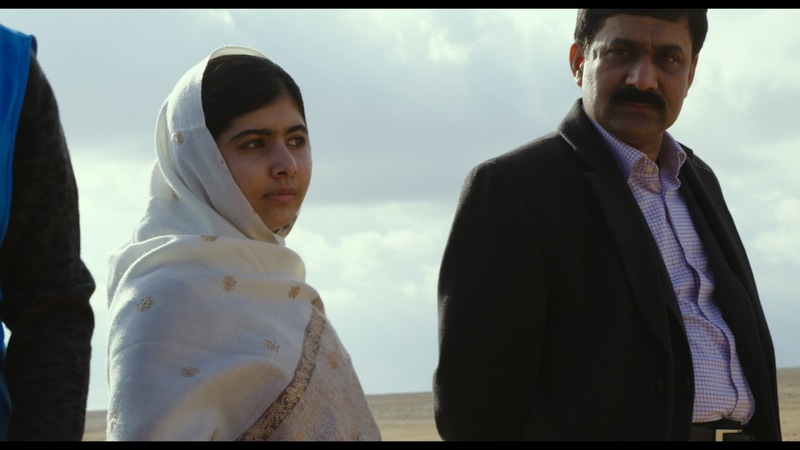 Girls’ education advocate Malala Yousefzai (left), with the encouragement of her father, Ziauddin (right), leads the way in promoting her cause around the globe, as chronicled in director Davis Guggenheim’s new documentary, “He Named Me Malala.” Photo courtesy of Fox Searchlight Pictures. Malala’s extraordinary story is truly stirring, to say the least. But it’s also a shining example of conscious creation at work, the means by which we manifest our reality through our thoughts, beliefs and intents. Given how Malala’s existence has unfolded, one might wonder why anybody would want to create circumstances as horrendous as these. But, as tragic as they were, one need only look at the many blessings that have come from this situation. For example, in addition to the courage, determination and strength of will she inspires, Malala has been able to draw global attention to her cause, a development that may not have come about were it not for this series of events. Similarly, consider the outpouring of heartfelt support for Malala in the wake of the shooting. Not only did this incident expand our global capacity for compassion, but it also undoubtedly played a role in the degree and speed of her healing. The collectively creative act of making her whole once again thus benefitted her personal well-being while enabling her to continue her work, an effort whose impact is being felt exponentially by many others far removed from her and her homeland. Having lived through an unspeakable experience such as this, one might think there would be a natural tendency to crawl back into one’s shell and stay there. However, Malala would have none of this. She faced her fears and carried on, living courageously and committed to her convictions. These are some powerful beliefs at work, and they have emboldened her to continue her campaign, no matter the risks. Even more remarkably, Malala admits in all sincerity that she harbors no ill will toward her attackers. This admission thus reveals a profound belief in the power of forgiveness. It’s something that many of us may not have the capacity to recognize, acknowledge or embrace, but Malala’s experience provides us with an incredible example to emulate. Indeed, if more of us were to buy into a belief in forgiveness than to a belief in retribution, we might be able to create a much better world. Perhaps her ordeal – and her reaction to it – were meant to inspire the rest of us. What a gift to humanity that is. At home with her mother Toor (left) and younger brother Atal (center), Malala Yousefzai (right) lives a life as an ordinary teenager, in stark contrast to her extraordinary life as a global girls’ education advocate, as seen in the inspiring new release, “He Named Me Malala.” Photo courtesy of Fox Searchlight Pictures. All of this has been made possible because of Malala’s tremendous sense of personal integrity. Anyone who creates their reality in line with his or her truest self will see results commensurate with that intent. This is apparent in the strength, veracity and magnitude of what she has wrought through her conscious creation efforts. Again, we would be wise to follow her lead in what we manifest for ourselves. The intensity of her conviction is apparent on a number of occasions in the film but perhaps no more so than in a speech she gives about her cause in which she boldly proclaims “One child, one teacher, one book and one pen can change the world,” a statement greeted with thunderous applause. 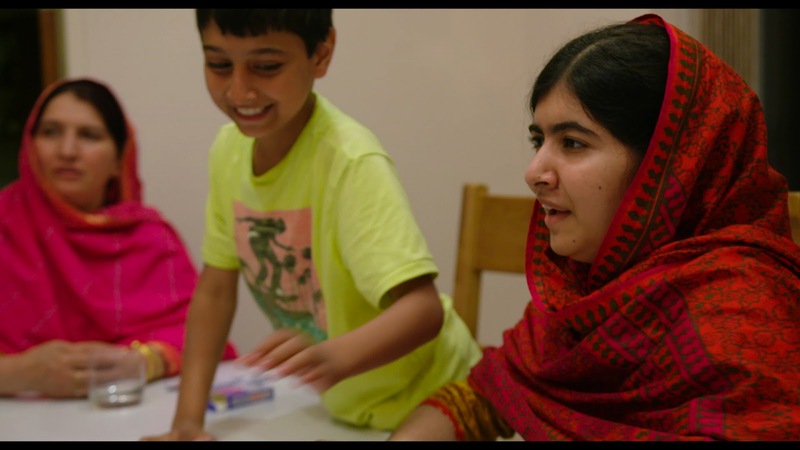 Furthering the cause of girls’ education takes activist Malala Yousefzai (center) far from her adopted home in England, such as to a remote school in Kenya, as seen in “He Named Me Malala.” Photo courtesy of Fox Searchlight Pictures. “He Named Me Malala” provides viewers with an intimate portrait of a transformative figure, both on a public and private level. It’s truly uplifting to watch Malala when she’s on the world stage (a venue in which she obviously feels quite comfortable), but it’s also touching to see her living the life of an everyday teenager who wrestles with all of the ordinary challenges most of us face when growing up. The film also does an effective job in documenting her ongoing work and in chronicling the events that led to the attempt on her life. The picture’s main problem, though, is one of organization of its material. Its individual segments tend to jump around a lot, which sometimes unnecessarily muddles the narrative. Nevertheless, the film is an excellent viewing option for schoolchildren, who could benefit tremendously from the inspiration of one of their own. One of the elements that sets this film apart from other more conventional documentaries is its incorporation of stunningly beautiful animation, designed by Jason Carpenter. A number of sequences, such as those recounting the legend of Malalai and the experiences of Malala’s parents, are presented using this approach, providing elegant contrast to the film’s other material, particularly the harder-edged footage of the fallout from the TNSM’s atrocities, both to Malala personally and to the Swat Valley in general. This inventive cinematic device works well, and the filmmakers made a wise choice in including it. When the stakes are stacked against us, we have two basic choices – turn tails and run or face the opposition placed before us and soldier on. Making the decision can be difficult. But, if we’re armed with the power of belief in ourselves and our convictions, there’s no telling what we might accomplish, even in the face of the staunchest foes. Malala Yousefzai shows us what’s possible and does so with her own brand of courage, confidence and grace. May we all have the fortitude to follow her example when we’re confronted with our own challenges – and the opportunities they present.